IntelliTouch automation offers superior control systems from small to the most ambitious pool and spa designs including water features and spectacular lighting effects. IntelliTouch Automation Systems offer innovative technology and a wide range of wireless and wired control panels that are easy to program with simple menus to enable pool owners to create and change programs without complication. 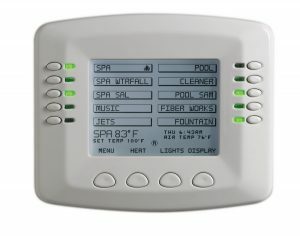 Users can choose the iPhone®, iPad®, iPod touch® or the MobileTouch® wireless (900MHz) control panel to complete their pool and spa automation system. Now works with ScreenLogic2® Interface software to allow IntelliTouch users to control their pool and spa features from an Apple® iPad®, iPhone®, iPod touch® mobile digital device or Android™ device, PC or Mac® computer. ScreenLogic systems now have advanced features such as remote monitoring and control over the internet and email alerts for specific events. Salt Chlorine Feature – Enables IntelliTouch Automation to control and monitor popular Salt Chlorine Generators including Pentair Aquatic Systems’ IntelliChlor® Salt Generator, Goldline Controls, AutoPilot®, and AutoClear® from the IntelliTouch Automation Indoor Control Panel or MobileTouch®Wireless Remote Control Panel. Users do not have to adjust the salt chlorine generator at the equipment pad. Support for IntelliFlo® pumps – IntelliFlo is the intelligent swimming pool pump that is changing all the rules. Adaptable to any application up 230 volts and 160 gallons per minute, you simply program IntelliFlo’s speed to suit the application. IntelliFlo then dials in the perfect power factor. IntelliFlo constantly monitors water flow and electrical current, making sure that the filtration system is operating at peak efficiency. And that means energy savings never before possible – up to 90% over conventional pumps. IntelliTouch Automation systems offer the flexibility to handle from 5 to 40 circuits that can be used to control any combination of pumps, lights, water features, etc. As an added benefit, user-configurable circuits (Feature Circuits) can also be used to control these combinations of features and more. Feature Circuits even add Macro possibilities where any number of circuits can be combined on a single button. This gives the pool owner the ability to set up “themes” with custom names all with one press of a single button. IntelliTouch Automation users can also dim any high voltage incandescent light such as Pentair Amerlite® and SpaBrite® up to eight levels using the IntelliTouch Automation Dimmer Module (P/N 520406). The dimmer module supports multiple lights from 100 watts up to 1,000 watts and installs in a standard relay location. Any number of dimmers (up to 10 maximum) may be used with a maximum combined load of 4,000W in a single Load Center. Expansion Kit requires Load or Power Center to be purchased separately, which includes five 3HP relays. Note: All IntelliTouch systems can be configured using wireless and/or wired user interfaces such as a PDA and/or wireless Tablet color touch screen device. IntelliTouch ScreenLogic® Kits are ordered separately.Apple®, Mac®, iPad®, iPhone® and iPod touch® are registered trademarks and App StoreSM is a service mark of Apple Inc. in the United States and/or other countries. Android™ is a trademark of Google, Inc.
Goldline® is a registered trademark of Hayward Industries, Inc.
AutoClear® is a registered trademark of Zodiac Pool Care, Inc.
AMX® is a registered trademark of AMX, LLC. Vantage™ is a treademark of Legrand Home Systems, Inc.
Lutron® is a registered trademark of Lutron Electronics. Elan® is a registered trademark of Elan Home Systems, Inc. The EasyTouch® Control System family offers a new level of control for homeowner’s looking for an affordable, easy to use pool/spa control system. EasyTouch allows full control of all pool/spa features including advanced features such as colored lighting and IntelliChlor® Salt Chlorine Generator support. Every EasyTouch system includes an easy to use control panel that is built into the outdoor enclosure. This control panel allows for full system setup, programmability, and everyday operation. In addition, there are several other available remote interface choices. 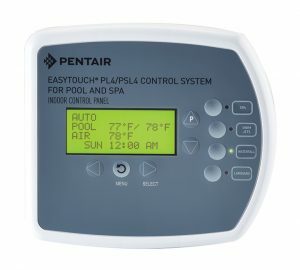 The EasyTouch systems come in a variety of configurations: Pool only or Spa only, Pool/Spa with shared equipment, and also integrated with Pentair IntelliChlor Salt Chlorine Generator. Apple®, Mac®, iPad®, iPhone® and iPod touch® are registered trademarks and App StoreSM is a service mark of Apple Inc. in the United States and/or other countries. Android™ is a trademark of Google, Inc.